March 24, 2010  Lawmakers are trying to figure out how to wind down mortgage giants Fannie Mae and Freddie Mac, while also shoring up the housing finance market in the wake of the financial meltdown. Republicans are ready to phase them out, but Treasury Secretary Timothy Geithner said any new plan should "preserve what was good but phase out what was too risky." March 23, 2010  The Senate Banking Committee approved an overhaul of banking regulations Monday. The move would create a consumer financial protection bureau under the Federal Reserve and require banks to pay into a fund that could bail out failing firms. Republicans say they will take their fight against the proposals to the Senate floor. March 17, 2010  With the fate of the health care bill still uncertain, Capitol Hill is swarming with advocates on both sides of the issue. Protesters have been knocking down the doors of lawmakers who are undecided, and bill supporters are pushing their message just as hard. March 16, 2010  Senate Banking Committee Chairman Christopher Dodd introduced a bill to overhaul financial industry regulations Monday. The move follows months of bipartisan negotiations that failed to produce agreement on such controversial issues as consumer protection and reining in practices that led to the financial collapse in 2008. The way forward looks murky, but Dodd plans to move the bill through his committee next week. March 8, 2010  Any day now, bipartisan negotiators in the Senate are supposed to unveil a bill that will rewrite the rules governing Wall Street. And when that happens, a lot of the credit for keeping the talks alive will go to Bob Corker, the junior senator from Tennessee. While he's not the top Republican on the Banking Committee, this is not his first go-round when it comes to bipartisan compromise. March 1, 2010  Health care may dominate congressional news, but lawmakers have not forgotten about drafting new rules for Wall Street. Democrats and Republicans on the Senate Banking Committee are working on a plan, with the hope of unveiling it this week. February 22, 2010  Even if Democrats can manage to agree on a health care bill, there's widespread rebellion from the states. More than 30 states are moving to block the federal government from imposing a central feature of the bill: the individual mandate requiring that everyone buy insurance. Legal scholars generally agree that the measure is constitutional. Still, Virginia's pre-emptive law is on the governor's desk. February 6, 2010  In the nation's capital, African-Americans make up more than 75 percent of the city's HIV/AIDS cases. To combat the disease and its spread, advocates and city health officials have decided to try to improve the link between being tested and being treated. Washington, D.C., and the Bronx in New York will be the site of a pilot research program designed to connect patients with a doctor, and put those patients on anti-retroviral medication as soon as they are diagnosed. February 6, 2010  While the Tea Party convention meets, another group of activists is meeting in Nashville, Tenn., to commemorate the 50th anniversary of the civil rights sit-in movement. January 29, 2010  He lived on the other side of the world from Brangelina and Octomom. In a culture where people dream of fame for the sake of fame alone, the reclusive novelist, who died this week at 91, was the anti-celebrity. January 23, 2010  National pundits were shocked by the outcome in Massachusetts, but this native of the state knows better than to pigeonhole its voters. 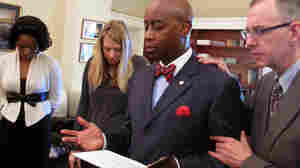 January 22, 2010  Barry Black is the first Seventh-day Adventist and the first African American to hold the post of Senate chaplain. He's also the man who sits squarely at the intersection of church and state at the U.S. Capitol.